Vacations are somewhat of a mixed bag when it comes to blogging. They often supply so many stories, it is difficult to select the very best ones that will not only entertain the reader, but also summarize the week’s experiences and activities in a neat, little, blog-ready package. 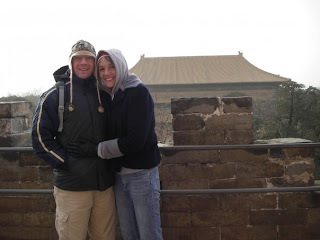 Wrapping up our trip to China in such a way seemed a bit daunting to me at first. How do you reduce the experience of trekking through one of the oldest civilizations in the world to a few quippy paragraphs? We toyed with a few ideas as to how to go about our overwhelming task and I decided to pick one of the more quintessential days and describe it for you. I hope that in this way, you will get an idea for a day in the life of a foreigner in China. 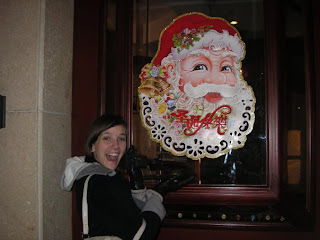 Since our trip took place over December 25, what better day to describe than Christmas day? In planning our trip to the Mainland, we anticipated a bit of gloom to hang over us on Christmas day since we would find ourselves sans family to celebrate the holiday. So, with the goal of preventative maintenance, we planned a tour to take us to the Great Wall on t he 25th. Our tour guide came and picked us up around 8:00 and we were off. On the way to the Wall, we made a few stops at the burial sites for the Emperors where our tour guide gave an impressively concise oration on the uprisings and downfalls of all the different dynasties and their leaders. We were also taken to a jade factory, a cloison factory, and a silk manufacturer. Of course at each stop, our guide made sure that we had ample opportunities to commemorate our trip to China in the maze-like gift shops. Chris and I decided to give in to the pressure at the jade factory where we bought a souvenir / Christmas gift for each other. Lunchtime was an interesting affair as various steaming plates were delivered to our table per a pre-determined menu. The most interesting element was the bottle of 112 proof rice wine given to us as a gift of appreciation. Didn't see that coming. So, our bellies full, we were finally off to the Wall. 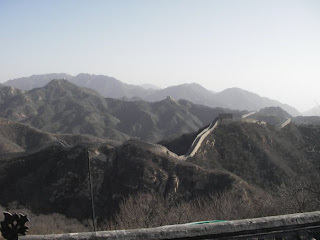 It probably doe sn’t surprise you to learn that there are actually several different places where one can visit the Great Wall. So, as we drove to the portion we chose, the snaking wall could be seen all over the side of the road juxtaposing the two cross-millennial highways. Our tour guide informed us that the cable car that usually runs to the top of the wall was not running since it was the slack season. Instead, we would be offered “sleds” to take us halfway to the top of our particular location. Not really knowing what to expect, we agreed to the sleds rather than hiking a few hours in the subzero temperatures. The “sleds” certainly did not disappoint. 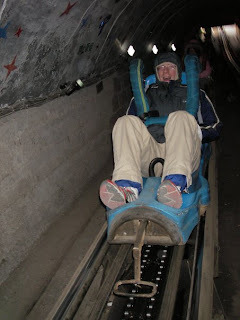 We were welcomed to the Great Wall of China by brightly colored cars on a roller coaster-style track gliding their passengers to a pre-designated point on the Wall. Reassuring ourselves that we were not, in fact, at Disney World, we exited the Great Wall roller coaster and began the rest of the ascent to the top. You may recall from our “Cup of Tea” blog, things rarely turn out the way I plan them, especially when we are abroad. I h ad this wonderful picture in my head where Chris and I would don Santa hats and skip cheerfully about the Wall spreading our Christmas cheer to the tourists and Great Wall memorabilia hawkers. Unfortunately, the frigid temperatures and gusting winds sapped a bit of our Christmas spirit. We snapped a few photos, shoved our hands in our pockets and faces in our jackets and marched to the top. Wincing as we removed our warm winter hats to replace them with Santa’s seemingly meager getup, we went to take THE picture. Ideal photo attempts were thwarted when we saw that the cold temperatures had sapped the camera battery and it was dead! Not ready to give in too easily, we braved the wind gales at the top of the Wall for a few extra minutes as we warmed the battery in our gloves. Ready once again for the shot, we made our best attempt at looking warm and happy, took the picture, and ran as fast as our numb legs would carry us back to a more covered location on the Wall to shelter us from the wind. Muttering through chattering teeth about the incredible thing we were witnessing, we decided that we had witnessed as much as we could before frostbite set in. So, we set our eyes back on the roller coaster that would guide us back down the hill and bring us a few steps closer to the car and the heat inside it. We had been planning all trip that we would experience the famed Peking Duck (a specialty of Beijing) for our Christmas dinner. 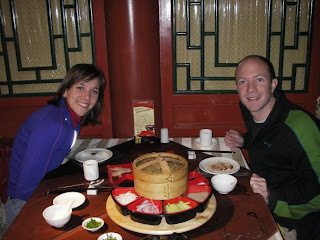 After sufficiently warming up after the Great Wall excursion, we decided it was time to eat. We had a restaurant in mind and we had our hotel write the name and address in Chinese to give to a taxi driver. After finally hailing a cab (which turned out to be more of a feat than we expected), we handed him the address. Explaining something about the address, we told him (I think) to just take us as close as he could. Well, take us somewhere he did. Where the restaurant was, we will never know. We wandered around the area asking directions from various English-speaking and non-English-speaking strangers for about 45 minutes. Thoroughly disheartened from hunger and cold, we finally stumbled upon a restaurant boasting the Beijing specialty. Though it wasn’t the restaurant we had planned, it was there and they had duck, so we didn’t care. After being led to a table and pointing to duck on the menu, we were informed that it takes 44 (not 45) minutes to prepare the duck, were we willing to wait? We figured that we had gone through enough to get there, what were 44 more minutes? So, wait we did. And I am to inform you that Peking duck is most definitely worth the wait. The chef came out with the duck on a board and proceeded to expertly carve the duck, shaving off bits of roasted skin along the way. Our waiter demonstrated the best way to wrap the slivers of duck with the right proportions of duck sauce, garlic, and vegetables in paper thin pancakes. The piece de resistance, however, was when the waiter instructed us to dip the skin into sugar and then into blueberry sauce. Fatty skin and sugar, what’s not to like? Rolling out of the restaurant, we hailed a taxi and were taken directly back to the hotel, something that we definitely didn’t take for granted. 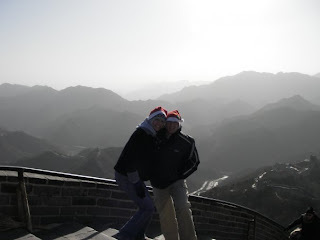 We decided that it was a very merry Christmas indeed and we looked forward to the rest that Beijing was to offer us.